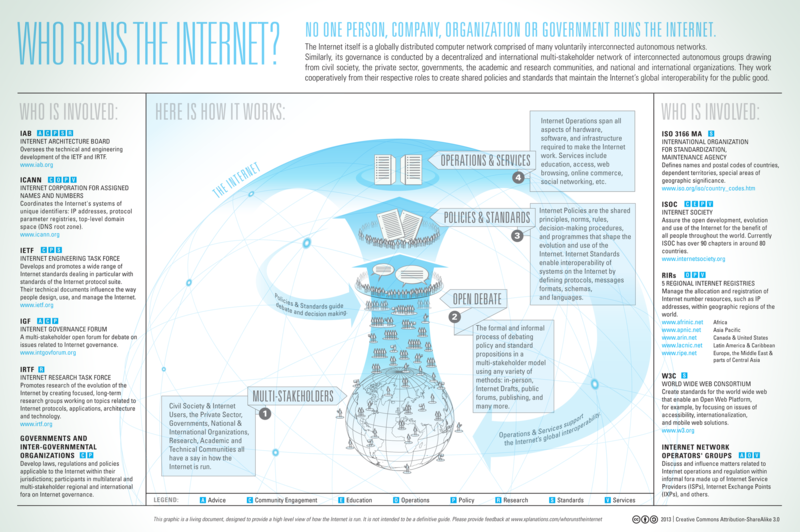 I came across the great infographic from ICANN titled, Who Runs the Internet? i want to brush up on my own knowledge about all the key stakeholders in the Internet, so I typed up some of the text from the infographic, for my own benefit, as well as to make it a little more interactive. The Internet itself is a globally distributed computer network comprised of many voluntarily interconnected autonomous networks. Similarly, its governance is conducted by a decentralized and international multi-stakeholder network of interconnected autonomous groups drawing from civil society, the private sector, governments, academic and research communities, and national and international organizations. They work cooperatively from their respective roles to create shared policies and standards that maintain the Internet's global interoperability for the public good.